Hey, if we were having a coffee this week, mine would be a free one with my 15th gold star. You’ll have to pay for your own. I’ve had such a fun end to the week that I’ve pretty much forgotten what happened at the beginning of it. I remember that the cold weather caused havoc on my way in to work one day. It took me nearly 90 minutes to do a 25 minute journey. I went straight in to a meeting where I was asked the question, “So who is going to do this?” I replied that it shouldn’t be me for reasons x, y and z. I was met with the reply, “Well I’m going to give it to you anyway and you’ll need to deal with it.” A bit later on someone said that I sounded exasperated. That really wasn’t the day to do that. I have no idea who has been given that task now. I’ve been watching The Staircase on Netflix. I actually just finished it today, and loved it. As I was leaving work on Thursday, I noticed that the defence attorney from that series, David Rudolf, was speaking at a venue in Manchester that evening. Unfortunately at that time I had two episodes still to watch and I wasn’t sure I’d be able to get there in time anyway. That would have made it three nights on the trot for me seeing ticketed events. On Friday night (as you may have seen) I went to go see Death Cab For Cutie. I went straight from work and got their much earlier than my company. I had a lot of difficulty finding something to eat, partly because of places being busy and partly because I was being indecisive. 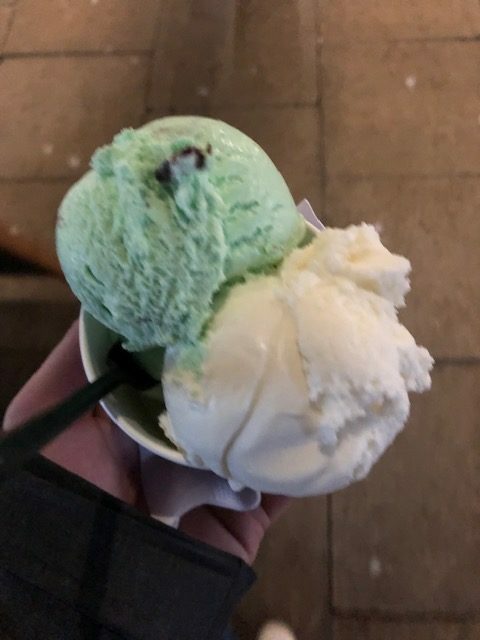 For some reason I definitely wanted something minty, so I went to go get a mint milkshake but the place was closing so I ended up just getting mint ice cream (with one scoop of white chocolate that I obviously had to eat first). Feeling that I really should have something savoury and now lacking the time for a sit down dinner but not wanting fast food, I went to a supermarket and found this abomination. 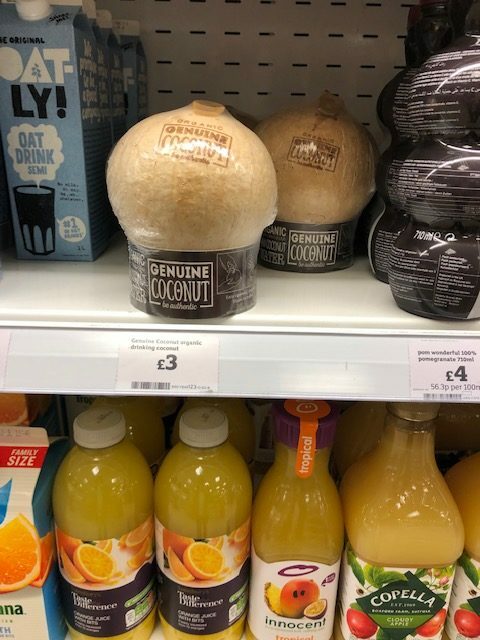 Yes, a coconut stripped of it’s natural defences and wrapped in single use plastic on a cardboard base. Outraged, I bought a cold pasty and it was (even for someone who fairly regularly eats cold pasties when necessary) was rubbish. 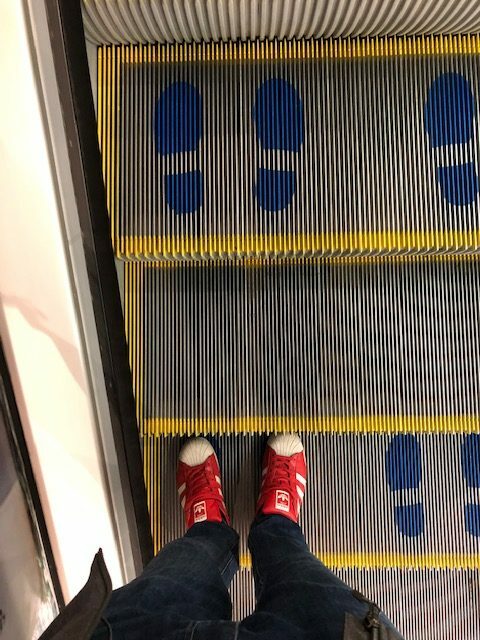 While I was there I made sure to use the escalators properly. I got up perhaps earlier than I should on Saturday to get some stuff done, but still seemed to be a long way behind by the time I wanted to get out to the next gig. Jimmy Eat World (probably my favourite band) were supporting one of my favourite artists, Frank Turner. I’d planned on doing some shopping, going to one of my favourite places to eat and meandering up to Victoria Warehouse via my first ever tram ride. The shopping was dropped, Moose was full and I realised that I had absolutely no idea how trams worked. I decided that I wasn’t that hungry anyway, and eventually found a tram map that I worked out despite the pressure of a long queue mounting behind me. I knew I wanted zone 2, and the internet said to get on the train to Altrincham and get off at Pomona. “Easy,” I thought. So, not paying attention, I didn’t really think to look at a map to make sure I was going the right way. Turns out that I needed to change somewhere. I got off 1.4 miles from the concert venue, in the rain. My tram journey should have been 2.4 miles. I then had to walk past the venue for another half a mile to meet my old boss and his family who I was also going to the gig with. They got their late and really wanted to eat but we couldn’t find anywhere with room despite a booking. We ordered an Uber for the 10 minute walk that took 16 to arrive and then went to KFC which had the slowest moving queue I’ve seen. I think we missed one Jimmy Eat World song, so it could have been worse. Now, Frank Turner has released 7 studio albums, two of which have gone gold (selling over 100k copies but less than 300k) and one silver (over 60k but less than 100k). He’s had 3 UK top 10 albums and his albums have spent a total 38 weeks on the chart, nearly half of that total coming from Tape Deck Heart. Jimmy Eat World’s third most successful album has sold over 255k copies in the US. Bleed American has sold over a million copies in the the US while also certifying Platinum in Canada and Gold in UK. The statistics aren’t directly comparable, but somewhere along the line someone will probably have heard either The Middle or Salt, Sweat, Sugar from Jimmy. I’m not sure that Frank has a similar song. So having what I would have thought being the bigger band supporting the smaller one seemed a little strange to me and there was a point where I thought that Jimmy were the better act on the bill last night. I just preferred their set. I wondered what it must be like for a band used to headlining to now be supporting. 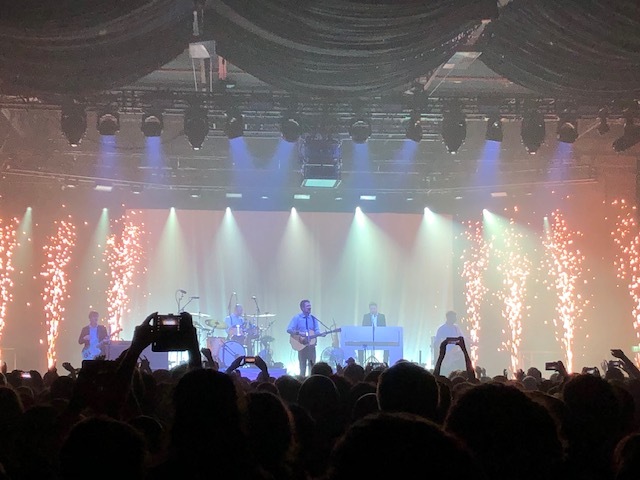 I wondered whether they adjusted their set to their audience and then I wondered whether they finish playing and have thought of, “there you you, follow that” – whether there is that competition. The other thing that was different for me was their sound. Jimmy are an emo rock band. Frank is folk punk. That means that Jimmy sound a lot more polished. I enjoyed the show and it was great to be able to see two of my favourite acts in the same night away from a festival. One of my friends was trying to convince me to go out early this morning. I didn’t promise anything other than that I would text when I got up. If I hadn’t text, I was asleep and therefore not going out. I woke up about 10 minutes before yesterday’s suggested time. I went out anyway, but was virtually crying as I walked in to the wind it was that cold, so that didn’t last long! I don’t know what my posting schedule is going to look like for the next few weeks. I’m going to be going snowboarding. I did say that I wouldn’t buy any new kit this year, but I ended up buying a new pair of gloves and a lens for my goggles. My original gloves were past their best so last year I bought some mittens which weren’t a good idea when I needed to use individual fingers to do up my bindings, for example. I also took a layer of leather off the palms thanks to my wrist guards. The lens is one for bright light so I now have that to go alongside my low light one. At least, then, they were useful purchases if not entirely necessary. Two new Pokémon this week! Both shiny ones. And… I think that’s about it. Hope you’ve enjoyed your week.